This Penn Cove Mussel recipe combines mussels with two other Northwest favorites, Uli’s sausage and great ale from Elysian Brewing Company. Add fresh grilled ingredients including fennel and onion and, of course, garlic and you’ve got a mussel dish with Northwest attitude! Get all of your pre-cooking done for this dish first. Heat the grill on medium heat, cut the fennel in half and quarter the onion, rub them down with olive oil, sea salt and fresh crack black pepper. Grill the onion and fennel until they start to get a good char on the outside, rotate it as needed. Cook the sausage until it is about 75% of the way cooked. You may need to finish cooking the vegetables in the oven so they soften. Julienne the fennel so they are nice long strips, mince the onions and small dice the sausage, reserve for when you are ready to make the dish. Buy sun dried tomatoes not in oil, reconstitute them as you need them, they will last longer. Soak the tomatoes in hot water for about 15 minutes prior to making the dish. Pick and chop the oregano, peel and mince the garlic, crack your beer and drink half of it, then save the other half for cooking. Rinse the mussels under cold running water, looking for any beards that might be left on and throwing out any broken shells. Heat the oil in a high sided pan on medium high heat, when the oil is hot add the mussels, be careful if there is any water in the pan it will cause the oil to splash up on you. The mussels should have a nice sizzle to them. Season with a little sea salt, fresh cracked black pepper (or pepper blend which is what I like to use) and a little bit or a lot of red crushed peppers. Gently stir the mussels with a spatula, being careful not to crush them. When the mussel’s just start to open add the garlic and oregano and cook for about 30 seconds, you should have a nice strong sweet smell of the herbs and garlic, continue to stir. Add the fennel, onions and sausage, stir well and cook for another 30 seconds, let the temperature come back up. Add the other half of the beer that you didn’t drink and simmer the mussels until they are fully cooked. 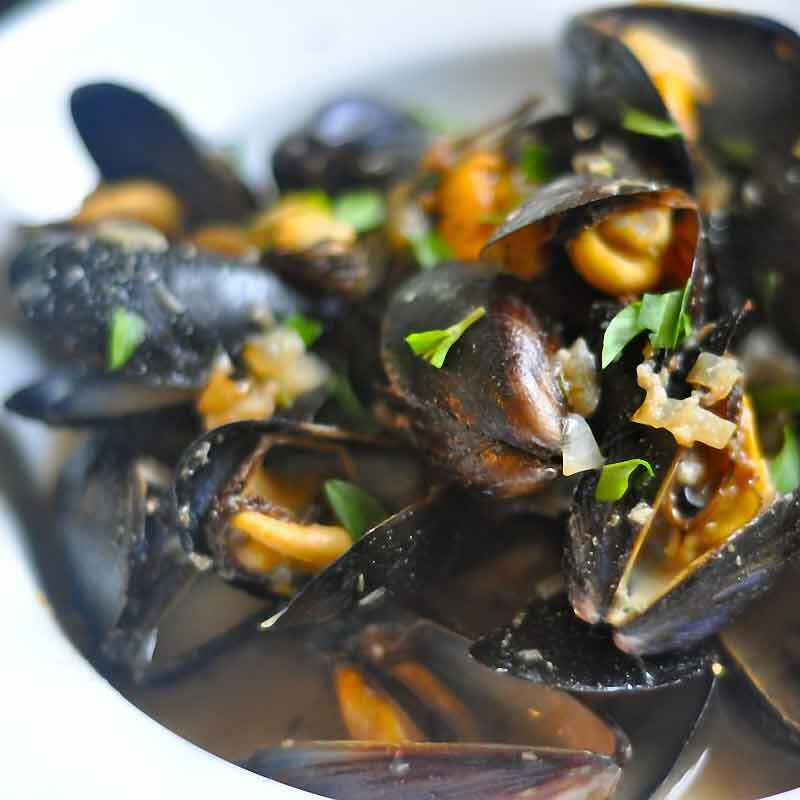 Mussels aren’t done with they open right away like clams are, you have to simmer them in the cooking liquid for a few minutes, let them soak up all that delicious flavor. When the liquid is about 1/3 of the way reduced, add the butter and melt it in. Taste a mussel and make sure the flavor is where you want it, serve with toasted or grilled bread, over rice or over pasta for an entrée option, ENJOY!